In the last couple years, I have heard parents expressing the same question, again and again. How do you teach a child to write well? You can hardly expect to be able to hand a child a pencil, and have them produce something coherent and well written without teaching them what good writing is. Even in my house, where so much of my time is spent sitting in front of the computer putting words on paper, teaching writing doesn’t come easily. I love to write, and I am so glad to have found a program that is helping me share that joy with my children. Classical Academic Press has a new writing program, called Writing and Rhetoric. Oftentimes, when I do a review for a homeschool company, the review is my first exposure to the product. This time, I had purchased the first books in the series, Writing and Rhetoric: Book 1: Fable on my own, and once I realized what I treasure it was, I just knew I had to share it with you guys- because this really is a one of a kind tool I think all homeschoolers should know about. 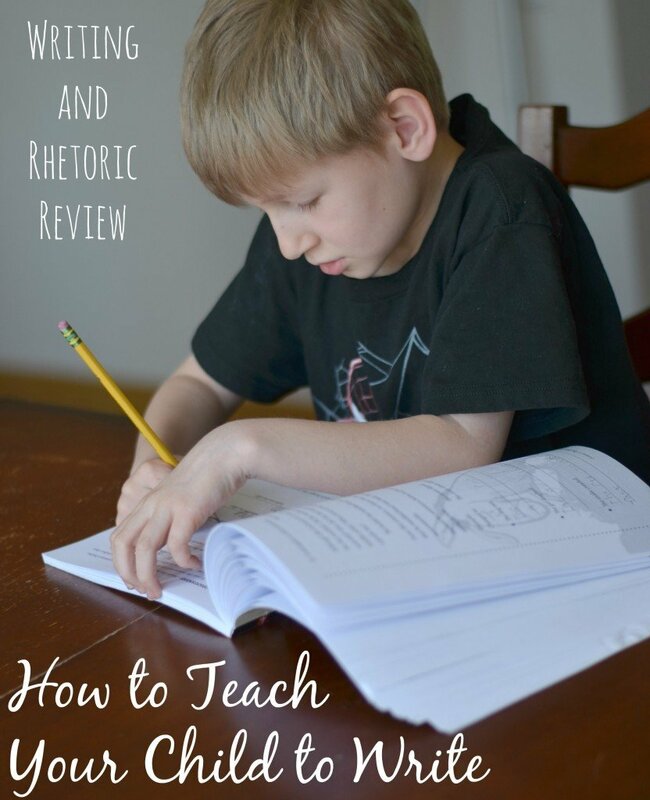 I contacted Classical Academic Press to share with them how much I loved the program, and they were kind enough to send me the second book in the series, Writing and Rhetoric: Book 2: Narrative I, to share in a review for you. 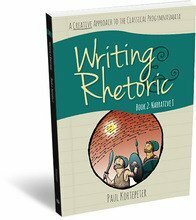 Writing and Rhetoric advertises itself to be a “Creative Approach to the Classical Progymnasmata”… which basically means this is a new, fresh way to teach writing; based on a time tested, well respected method that dates all the way back to Roman times. In the good old days, kids were taught with incremental steps, first by reading and enjoying beautiful writing, then by imitating beautiful writing, then playing with writing to make it their own, and finally, standing on their own two feet with their own original writing. The idea is that you would never expect a child to simply preform a beautiful piece of music without ever teaching them what makes the music beautiful, teaching them how to control the instrument, and how to preform the piece. It’s the same idea with writing- kids really need to know what good writing is, and be exposed to a lot of it, to be able to learn how to write themselves. I would personally define this series as first, teaching a child how to *think* about writing. What kinds of questions do you need to ask? What makes writing good? What words are the best words to choose? Secondly, it teaches a child how to get thoughts from their *head* down onto paper. Where do you start? What is important to share? How should it be shared? Once those two things happen- beautiful writing follows. The main goal for book one is to help kids learn to read passages fluently, with emotion (you can read the story for your child to help them hear how it should sound, or download MP3s of the stories from CAP). They also learn to take dictation and copy passages correctly, summarize and amplify stories, and more. First, you’ll read a short lesson, where new vocabulary is introduced, and then you’ll read the story. Next, you’ll have your child tell you the story back, and discuss the story with your child, asking important questions. You’ll talk about the meaning, answer questions about vocabulary, and play with analogies. Then, you’ll do a copy work and dictation assignment, play around with sentences (changing meaning or structure, adding details, and so on), and work with grammar concepts. Then, you’ll summarize, retell, and/or amplify the story in your own words. Finally, your child will have a speaking assignment, where they will memorize, or read their own writing to an audience (we do this at lunch, and all the kids listen and enjoy). One of the unexpected benefits to using Book 1: Fable is the wonderful moral content in the book. The stories featured are Fables, and the moral of the story is always discussed. I personally counted this book as not only our writing curriculum for the semester, but also wrote down a credit of Character Education, since my child learned so much about moral concepts from the Fables! They have a very generous three week sample up on the website, so you can truly “try before you buy”- by the end of our first week, I had purchased the book, and was able to keep working while I waited for it to arrive. Book 2 continues to build on the concepts in book one, only it starts to work with longer narrative passages rather than short fables, and it introduces concepts like plot, dialog, and using creative descriptions. It is different from Book 1 in that instead of simply telling back what happened, and making the story shorter or longer, sometimes they actually change what happens by manipulating the point of view or events in the story. This is the first step to making writing their own, instead of just working with the story they have been given! This book also goes deeper into grammar concepts, explores more vocabulary, and encourages more sentence manipulation. Again, the reading selections are well chosen- they are stories that I would consider to be culturally significant, and give children a basis of cultural references and archetypes that will serve them well for years to come. Try the free sample to see where the program is headed after Book 1, or tide you over while you wait for your copy to arrive. Where is the program heading? This program is so much more than being able to simply write a good paragraph. This is not formulaic writing, so it does take some time for your kids to understand how to write clearly. The great news is you’ll see your child being successful right away. I had never seen Bug write a story before he sat down to use this book, and now he is able to compose about a page worth of writing without drama. In the first three books, children are learning to narrate, and to use solid, descriptive language and logical organization. In book four, kids will learn to write an expository essay, incorporating everything they learned in previous books as well. In the fifth-seventh books, persuasive essays are added, while they continue sharpening previously learned skills. Right now, Classical Academic Press only has the first three books of this series released, with book four coming out next month. This amounts to about two years worth of material. They do, however, have a clear path of books to come, which are being released at regular intervals. At the end of production, there will be 6 years worth of writing books, at which time your child will be ready for high school level composition. If you are a secular homeschooler, you may know Classical Academic Press is a Christian company, and as so, these books do include biblical stories and concepts. Book 1 focuses on Fables (mainly Aesop) and includes many teachings on morals, and briefly makes note of biblical concepts when appropriate. The second book, Narrative 1 does include Bible stories for some of the writing selections. I was comfortable using every selection from these books, and was never uncomfortable with the content. I feel that homeschoolers from most religious traditions will be able to comfortably use this curriculum because the examples and teachings given are either universal (as in the case of the fables) or stories that are culturally valuable. The book shares the stories without preaching, and is very respectful to all walks of life. I do recommend you check out the samples to see what I mean and if the books will work for your family. The story of the prodigal son is featured in the sample online for Narrative 1, so you’ll be able to easily make the call for your own home. I personally give them my “secular homeschooler” stamp of approval. A GIVEAWAY and Classical Academic Press SAVINGS for you! I really appreciate Classical Academic Press for being so generous with my readers. 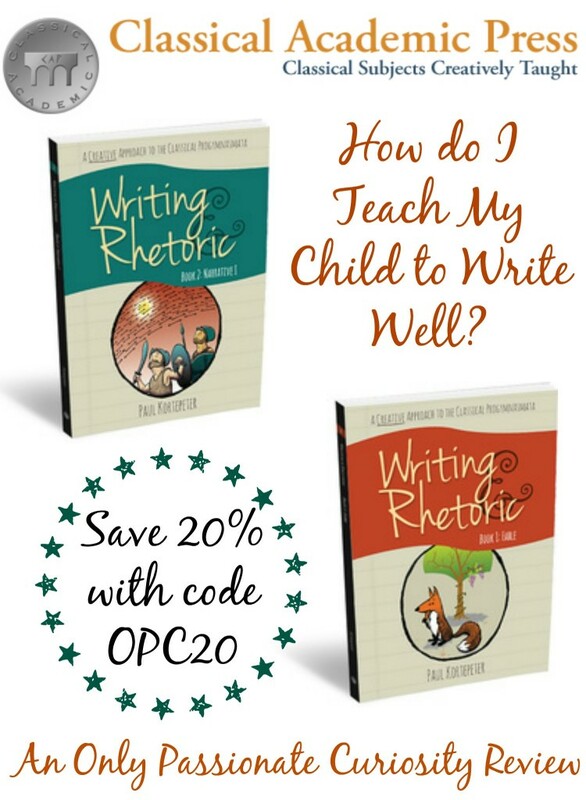 In conjunction with this review, they have offered a coupon to save you 20% off in their online store with the code “OPC20”. This coupon is good for any of their products (Latin, anyone? ), other than Singapore Math, and is valid until May 18th. 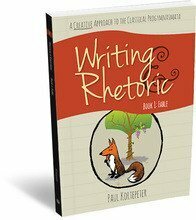 I also have a giveaway of Writing and Rhetoric: Book 1, Fable to get you started writing. Enter to win using the raffle copter form below! We are just starting with my son who is 11 and just now ready for a writing program. Reading was a long process and we eased into grammar last year. My question is about placement. We are starting with book 1 to see how we do. Once reading was tackled my son grew in his ability at a rapid pace…. From second grade readers to fifth grade and above in a matter of months. I’m wondering if writing will also adjust as he gains skills. Should I expect to skip over books and place him in books more aligned with his age and grade equivalent? ideas? I would anticipate moving a little more quickly through the books, but I wouldn’t plan on skipping any of them- they build on each other so nicely! I know this is an old post, but I was wondering if you are still using this writing curriculum? I have IEW but haven’t started as it seems a bit overwhelming. My oldest is 9 and is ready for real writing, but I have 5 more kids younger than him and it doesn’t seem possible to watch IEW DVDs and then teach writing. I’m not the best writer either! Also, we love CAP’s Latin so I thought we would love their writing program too. We are! W&R is an amazing program- I did end up signing Bug up for the live class with a teacher from CAP’s Schole Academy because I am SO short on time and energy these days. It’s a program I am willing to invest the time and money into because it is so solid and creative. I’ve seem Bug grow leaps and bounds with it. Doodle will start with it sometime in the next year- I don’t know if I want to put him in the live class yet (he’s autistic, so while he is the right age, I don’t know if he’s ready) or if he should wait until the next year, or if I should teach it…. which really is a convo for a different day. Regardless, yes, we love this program and yes, are still using it. I have been looking at this writing set and thinking of buying. Writing has been our subject I have not found something I would like to continue using. So far it is going well. My daughter enjoys writing, so that helps a lot. The main trouble right now is correct punctuation and avoiding run-on sentences. Writing is going okay. I have all sons and if anyone knows anything about boys they aren’t particularly fond of writing. I have adopted the Brave Writer style and that seems to work well. I probably don’t assign as much writing as I should. Thanks for the review. I will check this one out. I don’t like to hop too much though. I can see where a new baby would make you want more independent learning! I thought we would have a new one by Oct but we lost it. I have been looking for something like this! Writing is going well with my daughter, but not-so-much with my sons. Writing is going strong right now. We are at the tail end of our curriculum and I’m in the market for something new. My daughter enjoys writing in many formats. This curriculum sounds great and we would love to give it a try! Thank you for the opportunity! I like using unit studies. Looks like a great approach! Writing is not going very well. I’ve never heard of this program. Thanks for sharing and thanks for the giveaway! Right now we are taking a break but we were using IEW. My oldest son loves to write, but has trouble with details. My youngest doesn’t. I have been looking for a good program for them. My computer keeps eating my comments. Just wanted to say thanks, just used the 20% code! I’m committed to the idea of the progymnasmata, but as I never learned it, I find it hard to teach, especially to my aspie son. (Thank you, by the way, for sharing the basic overview of what classical writing is. Your description was very helpful!) I think we both need something more broken down. I did buy CAP’s Narrative 1 book for him for next year because we didn’t do any writing this year after pushing through a previous year of CW. I was all set to use CW with my upcoming 3rd grade DD next year, just because I own it already, but after reading this, I’m seriously considering CAP for her, too! Thanks, again, for your review! If I remember right, your child is working ahead of grade level, correct? I’m thinking about this for my son for 2nd grade, because he is ready for 3-4th grade material in every other area but spelling. Do you think it works well for a younger advanced student? We started book one in January, when Bug was 7, and half way though (what would have been) his second grade year. As far as curriculum goes, he’s starting 4th grade level work. I do think it’s perfect for younger, advanced kids. The content is all very friendly to younger kids, and the stories hold their attention. It’s incremental enough to not be overwhelming. Hope that helps! Thanks! We are going to give it a shot for 2nd/7.5yo as well. I have a new baby arriving, so I need to switch to something a bit more workbooky than Bravewriter for a time, and this program just looks too good to resist! I’ve been considering this program for next year with my third graders. Thanks for the review! PS- We’ve been doing more writing workshop type of work, but I really like the example lessons on the website. A writer myself, I also find teaching writing a challenge. My kids love to do independent creative writing – they all have their own stories tucked in folders on my laptop – but I really want something structured, thorough, and fun. 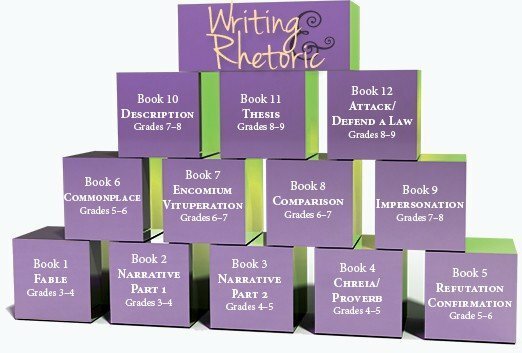 We use several CAP products and are excited to add Writing & Rhetoric next year! Yes, I do. You can always work alongside them, and do the activities orally. I move slowly through the book, and it works well with my kiddo. We started with Fable at 7.5. It sounds like a great program. I love that it teaches about morals and exposes the children to fables and biblical principals a bit too. Isn’t it awesome how it does double duty like that? I would really love to win this book. I am very excited to try this program with my oldest son. Thank you for the review. Thank you so much! Will definitely be using the coupon code! Writing has been a bit of a chore; I can tell Writing & Rhetoric will make it more enjoyable! My daughter loves to write and she has a great imagination! I’m always open to new ideas on how to help her with this. Our writing is like pulling teeth! I have been very interested with this curriculum and I appreciate the review. I was planning on starting this in the second semester next year or the year after, winning this would also be a plus! I’ve had my eye on this for a while. Thanks for your review. Any thoughts on when to start this with reluctant writers. I have an upcoming 3rd grader who is just now getting more comfortable with writing, so I’ve been thinking about holding off for now until she can really enjoy it more. I’d love to hear your thoughts. I’d probably wait until he could write 4-5 sentences comfortably, although you could do this book verbally, and only write some of the assignments. I am so excited to hear that you love this program. I have been searching for a writing program for my son that isn’t a fill in the blank program and doesn’t require a lot of creative writing. My son struggles with coming up with an original idea to write about and creating a story. I would love to start this curriculum with him! This really is a great program- it sounds like it will work well for your son! It doesn’t ever just “throw them in,” it’s all very deliberately taught, so they know exactly what to do every step of the way. The best news is, it isn’t formulaic either, so before too long, your son will be much more comfortable putting his own thoughts into writing. Writing is awful for us right now. We’re doing better, but I just can not seem to teach it well.